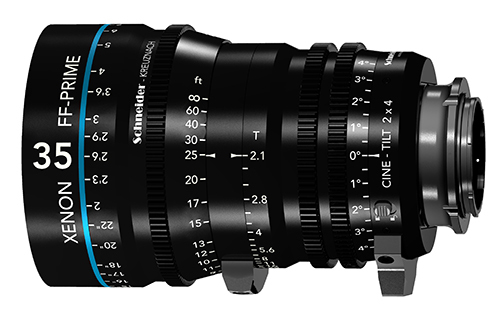 To enhance today’s dynamic cinematography, Schneider-Kreuznach introduces Xenon FF-Prime Cine-Tilt lenses. This groundbreaking new version combines similar form-factor and capabilities of the company’s popular Full-Frame Primes with added tilt function up to ±4°. By sustaining the field of view during focus and tilt actions, the new Cine-Tilt design makes possible previously unimaginable images from the freely moving and tilting focus planes. The new lenses offer the potential to utilize out-of-focus areas in the frame, especially when tilt is used with large apertures. A 4° tilt angle at the sensor plane corresponds to an 80° focal plane, which varies according to the focal length and aperture setting selected. Cine-Tilt FF-Primes will be available this spring individually or as a set, in Sony E-Mount. For press information outside the US contact Lion and Fishes GmbH, fon +49 69 210 860 12. This entry was posted in 3rd Party Lens and tagged Schneider-Kreuznach, Xenon FF-Prime Cine-Tilt Lenses. Bookmark the permalink. Trackbacks are closed, but you can post a comment.